Solidarity with Rasmea Odeh and event organizers under attack in Amsterdam! 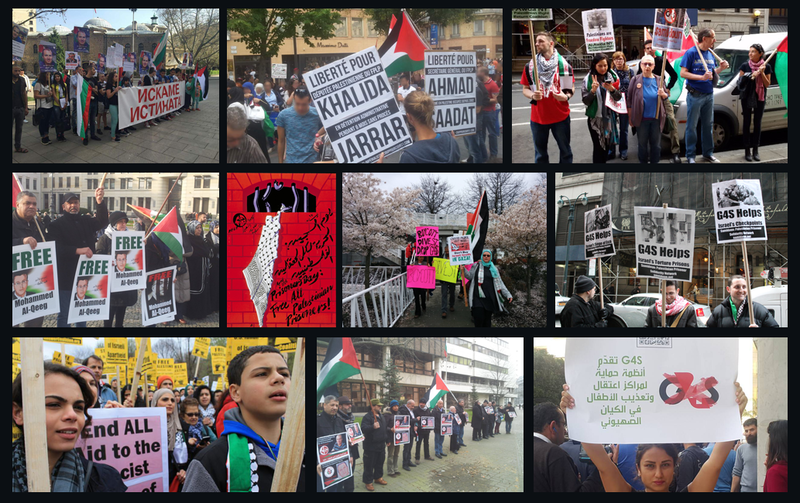 Home Campaigns Rasmea Odeh Solidarity with Rasmea Odeh and event organizers under attack in Amsterdam! Samidoun Palestinian Prisoner Solidarity Network stands in solidarity with former Palestinian prisoner, torture survivor and resister against U.S. and Zionist repression Rasmea Odeh and the revolutionary youth organizers in the Netherlands under attack by Zionist organizations and far-right, racist political parties seeking to suppress action in support of the Palestinian cause. Since the announcement of the event in Amsterdam featuring Rasmea Odeh organized by Revolutionaire Eenheid (Revolutionary Unity) and Anakbayan, the organizers and Odeh have come under sustained efforts to attempt to silence Rasmea’s voice and stop the event from taking place. The event will take place on Tuesday, 27 February in central Amsterdam at 7:00 pm. Samidoun urges all supporters and friends of Palestinian prisoners and the Palestinian cause to register online for this event: https://goo.gl/forms/TJUbfUfj55lUlBKK2 Registrants will be provided with the venue and other relevant information. Rasmea Odeh is not only a survivor of torture, deportation and 10 years of Israeli imprisonment, she is also a community leader and organizer of Palestinian women and the Palestinian people as a whole. Her clear, principled voice must be heard. We salute Rasmea and the organizers for their continued struggle for the liberation of Palestine in the face of relentless attempts to silence and suppress their critically important work. The Zionist lobby is reacting wildly to a meeting with Palestinian hero Rasmea Odeh, that will take place coming Tuesday 27 February at a TBA location. The PVV party of Geert Wilders, a racist and fascist party, has asked questions in parliament and wants the Netherlands to stop Rasmea Odeh from entering the country. The VVD party of PM Mark Rutte, a conservative ruling party, wants the Justice Officer of Amsterdam to be present at the meeting ‘to observe and prosecute anti-Semitic comments’. At the same time the Nassauchurch, where the event was supposed to take place, has received threats from the Zionist movement. We denounce these threats to the church. It is a disgrace that threats are used as a means of action. These attempts to stop the meeting from happening are doomed to fail. We have found a new location and will disclose this to anyone registering through: this link. As Revolutionary Unity we are the least surprised about these actions from the Zionist movement. The struggle of Odeh is aimed at the Zionist colonial movement and it is logical that this movement defends its own rotten interests. We want to make clear that there is a conflict of which the aggressor is the Zionist movement. This movement violently ethnically cleansed the land of Palestinians and created a state that is known for its human rights violations. The ‘Israeli’ state, with 65 discriminatory laws, can be legitimately called an Apartheid state. The Palestinian liberation movement, aimed at the ‘Israeli’ Apartheid state, is fighting a just struggle. This progressive movement strives to achieve one democratic state in the whole of Palestine, with an equal existence for all people, regardless of their nationality, ethnicity or religion. It is therefore quite bizarre to hear that the VVD asks to ‘observe and prosecute anti-Semitic comments’. Rasmea Odeh nor the organizers are anti-Semitic and subsequently there will be nothing to ‘observe and prosecute’. Revolutionary Unity struggles against all forms of racism and discrimination. We are consistent in this. That is why we organize against ‘Israeli’ Apartheid AND we will commemorate the heroic February strike*. Rasmea Odeh, who, among other things, achieved to organize 600 women in a committee that defends the interests of Arab women, is an inspiration for many activists. And while armed resistance is a legitimate means to achieve national liberation, Odeh’s confession about her participation in an alleged attack were obtained through torture. Odeh and her stories about resistance against ‘Israeli’ Apartheid and imperialism in general are very informative. We invite all proponents of human rights to hear Rasmea Odeh with their own ears.